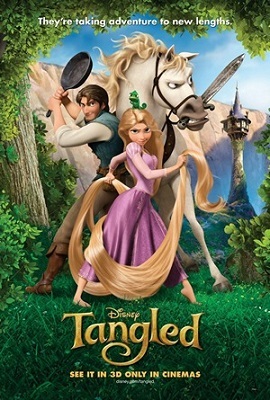 Tangled (2010) has rapidly become one of the most quotable Disney movies in history. Find your favorite Tangled quotes verbatim here so you can use them in blogs, inspirational posters, interior décor, and more. If you haven’t seen this movie yet, you’ve missed out. Read the synopsis below to see why your friends and family members often use Tangled quotes in everyday conversation. This film opens with the story of an old woman who uses a magical flower to restore her youth. However, a queen in a nearby kingdom becomes ill, and she eats the flower to become healthy again. The queen later gives birth to a daughter, Rapunzel, whose hair has the same abilities as the magical flower. The old woman, Gothel, kidnaps Rapunzel and raises her as her own daughter, using the princess’s hair to stay young. She keeps Rapunzel’s hair long because cutting it destroys its power, and she locks the princess away in a tower so no one else can use her magic. on her birthday. He agrees, and hilarity ensues as they make their way to the lantern’s source, avoiding the authorities and a furious Gothel along the way. Gothel eventually catches Rapunzel and takes her back to the tower. But Rapunzel’s journey to the lanterns has revealed her kidnapping as an infant, and she tries to escape. Flynn comes to rescue her, cutting off her hair to free her from Gothel’s attention. Then he and Rapunzel return to the kingdom to reunite her with her real family. Browse the Tangled quotes below to see what else this movie has in store for you. Hook Hand Thug: Go, live your dream. Hook Hand Thug: [Referring to Rapunzel] Your dream stinks. I was talking to her. Flynn Rider: Her hair glows! Rapunzel: We're alive. We're alive! Flynn Rider: I didn't see that coming. Rapunzel: Eugene. Flynn Rider: The hair actually glows. Flynn Rider: Why does her hair glow! Flynn Rider: [almost in hysteria] What? Rapunzel: It doesn't just glow. Flynn Rider: [Pascal smiles at him smugly] Why is he smiling at me? Flynn Rider: This is the story of how I died. Don't worry, this is actually a very fun story and the truth is, it isn't even mine. This is the story of a girl named Rapunzel. Flynn Rider: Frying pans... who knew, right? Flynn Rider: [clears throat] You know, I can't help but notice you seem a little at war with yourself here. Flynn Rider: Now, I'm only picking up bits and pieces here, of course. Overprotective mother, forbidden road trip. I mean, this is serious stuff. But let me ease your conscience. This is part of growing up. A little rebellion, a little adventure, that's good. Healthy, even. Flynn Rider: I know. You're way over thinking this, trust me. Does your mother deserve it? No. Would this break her heart and crush her soul? Of course. But you've just got to do it. Rapunzel: "Break her heart"? Flynn Rider: [plucks grape off vine] In half. Flynn Rider: [squeezes grape] Like a grape. Rapunzel: She would be heartbroken. You're right. Flynn Rider: I am, aren't I? Oh, bother. [sighs] Flynn Rider: All right. I can't believe I'm saying this, but I'm letting you out of the deal. Flynn Rider: That's right, but don't thank me. Let's turn around and get you home. Here's your pan, here's your frog. Flynn Rider: I get back my satchel and you get back a mother-daughter relationship based on mutual trust, and violà , we part ways as unlikely friends. Rapunzel: [pushes Flynn away] No. I am seeing those lanterns. Flynn Rider: Oh, come on! What is it going to take for me to get my satchel back? Rapunzel: [holds up frying pan] I will use this. Flynn Rider: [Referring to Pascal] Why is he smiling at me? Flynn Rider: Did I ever tell you I've got a thing for brunettes? Hook Hand Thug: Head down. Hook Hand Thug: Arms in. Hook Hand Thug: Knees apart. Flynn Rider: Knees apart... Knees apart? Flynn Rider: [after enlightening Rapunzel on his past] You can't tell anyone about this, okay? It could ruin my whole reputation. Rapunzel: Ah, we wouldn't want that. Flynn Rider: Well, a fake reputation is all a man has. Rapunzel: [quickly] Please don't freak out! Flynn Rider: [Makes strange almost-freaking-out noises as a result of stopping himself from freaking out] I'm not freaking out, are you freaking out? No, I'm just very interested in your hair and the magical qualities that it possesses, how long has it been doing that, exactly? Flynn Rider: Here's your pan, here's your frog. Flynn Rider: You smell that? Take a deep breath through the nose. Flynn Rider: Really let that seep in. What are you getting? Because to me, that's part man-smell, and the other part is really bad man-smell. I don't know why, but overall it just smells like the color brown. Your thoughts? Flynn Rider: Oh no. No, no, no, no, no. This is bad. This is very, very bad. This is really bad. [pause] They just can't get my nose right! Mother Gothel: Look in that mirror. I see a strong, confident, beautiful young lady. Mother Gothel: Oh look, you're here too. Thug: That's a lot of hair. Flynn Rider: She's growing it out. Flynn Rider: Oh mama, I've got to get me one of these. Gothel: I love you very much, dear. Rapunzel: I love you more. Gothel: I love you most. Rapunzel: So mother, earlier I was saying tomorrow is a really big day, and you didn't really respond, so I'm just gonna tell you: It's my birthday! Tada! Mother Gothel: No no no, can't be. I distinctly remember, your birthday was last year. Rapunzel: That's the funny thing about birthdays, they're kind of an annual thing. Flynn Rider: But I know what the big question is? Did Rapunzel and I ever get married? Well I am happy to say after years and years of asking, I finally said yes. Flynn Rider: Okay, okay. I asked her. Rapunzel: And we're living happily ever after! Flynn Rider: Yes we are. Rapunzel: Who are you, and how did you find me? Flynn Rider: [clears throat] I know not who you are, nor how I came to find you, but may I just say... Hi. How ya doin'? Flynn Rider: You were my new dream. Rapunzel: [crying] And you were mine. Flynn Rider: So! You're being strangely cryptic as you wrap your magic hair around my injured hand. Rapunzel: Sorry! Just, don't... don't freak out. Rapunzel: Too weak to handle myself out there, huh, Mother? Flynn Rider: Max! You brought them here? Flynn Rider: Yeah, you're right. We should go. Flynn Rider: Gothel broke into the castle, stole the child, and just like that, gone! Flynn Rider: Enjoy prison! I'll miss the sound of your laughter! Flynn Rider: [Arrives at the tower in attempt to rescue Rapunzel from Gothel] Rapunzel?! Rapunzel, let down your hair! Flynn Rider: [after being dropped face-down on the floor] You broke my smolder! Rapunzel: [about Flynn] I think he likes me. Rapunzel: [retorts] No! Mother Gothel: No? Oh. I see how it is. Rapunzel knows best; Rapunzel's so mature now./Such a clever grown-up miss./Rapunzel knows best. Fine, if you're so sure now,/Go ahead and give him this, huh? Mother Gothel: This is why he's here! Don't let him deceive you!/Give it to him, watch, you'll see!/Trust me, my dear, that's how fast he'll leave you./I won't say I told you so!/No, Rapunzel knows best!/Well, if he's such a dreamboat,/Go and put him to the test!/If he's lying, don't come crying/Mother... knows best! Flynn Rider: Well...you can image what happened next, the kingdom rejoiced for their lost princess had returned. The party lasted an entire week, and honestly, I don't remember most of it. Mother Gothel: Yes. The wanted thief, I'm so proud. Rapunzel: So... Flynn. Where are you from? Flynn Rider: the hair... Rapunzel: Nope. Flynn Rider: ...frankly, I'm too scared to ask about the frog. Flynn Rider: Can't you see me in a castle of my own because I certainly can. All the things we've seen and it's only eight in the morning! Gentlemen, this is a very big day! Flynn Rider: [to a thug] Is that blood in your mustache? Flynn Rider: Goldie, look at this! Look at all the blood in his mustache! Good sir, that's a lot of blood! Mother Gothel: [angrily] Enough with the lights, Rapunzel! You are not leaving this tower! EVER! [sits down dramatically] Great. Now I'm the bad guy. Rapunzel: Oh, I'm so sorry. [Places her hair on the wound] Everything's gonna be okay. Flynn Rider: [Shaking her off] No, Rapunzel. Rapunzel: I promise. You have to trust me. Rapunzel: Come on, just... breathe. Flynn Rider: I can't let you do this. Rapunzel: [Tearfully] And I can't let you die. Flynn Rider: ...then you will die. Rapunzel: Hey... It's going to be all right. Flynn Rider: Rapunzel. [Rapunzel looks at him] Wait. Captain: What's this? Open up! Flynn Rider: How did you know about her?! Tell me now! Stabbington Brothers: [Frightened] It-- It wasn't us! It was the old lady. Flynn Rider: You should know that this is the strangest thing I've ever done! Mother Gothel: You are not leaving this tower EVER! Rapunzel: I can’t help but feel like they’re meant for me. Rapunzel: Mother was right, I never should have done this. [crying] I'm so... I'm so sorry Flynn. Flynn Rider: [sheepishly] My real name is Eugene Fitzherbert. Someone might as well know. Rapunzel: [smiling a little] I have magic hair that glows when I sing. [pause] Flynn Rider: What!? Rapunzel: [realization] I have... magic hair that glows when I sing! Rapunzel: [after releasing branch that hits Hook Hand Thug on the head] Put him down! [Rapunzel: Okay, I don't know where I am and I need him to take me to see the lanterns because I've been dreaming to see them my whole life! Find your humanity! Haven't any of you ever had a dream?! [Hook Hand Thug: [draws his battle axe and walks over to Rapunzel] I had a dream once. Mother Gothel: [after tricking Rapunzel into returning to the tower with her] I really did try, Rapunzel. I tried to warn you what was out there. The world is dark and selfish and cruel. If it finds even the slightest ray of sunshine, it destroys it. Flynn Rider: All right, Blondie. Rapunzel: [to Maximus] Look, today is kind of the biggest day of my life. And the thing is, I need you not to get him arrested. [Maximus glares at her] Just for 24 hours, and then you can chase each other to your hearts' content, ok? [Maximus glares again] And, it's also my birthday, just so you know. Mother Gothel: You want me to be the bad guy? Fine. Now I'm the bad guy. Mother Gothel: [After Eugene cuts Rapunzel's hair, killing the healing power] NO!! [Grabs the hair as it turns brown] Oh, no! NO!! [Her skin begins to wrinkle] WHAT HAVE YOU DONE?! [Her hair turns white] WHAT HAVE YOU DONE?! NO! [She desperately goes to the broken mirror, and sees her old, haggard face; She shrieks, and covers her eyes with her cloak] OH, NO! NO! NO, NO, NO, NO, NO! [Pascal makes her trip in Rapunzel's cut hair and she falls off the tower window] AH! Flynn Rider: Ah, there it is! The Snuggly Duckling. Don't worry, very quaint place, perfect for you. Don't want you "scaring" and giving up on this whole endeavor, now do we? Rapunzel: Well... I do like ducklings! Flynn Rider: [to himself] Is this... hair? Rapunzel: [hiding in the dark] Struggling... struggling is pointless! I know why you're here and I'm not afraid of you. Rapunzel: [steps into the light] Who are you, and how did you find me? Rapunzel: Who are you? And how did you find me? Flynn Rider: [clears throat] I know not who you are, nor how I came to find you, but may I just say... Hi. How ya doin'? The name's Flynn Rider. How's your day goin'? Rapunzel: [scoffs] Who else knows my location, Flynn Rider? Flynn Rider: Gesundheit. Here's the deal. I was in a situation, galavating through the forest, I came across your tower and... Oh... oh no... where is my satchel? Rapunzel: [proudly] I've hidden it. Somewhere you'll never find it. Flynn Rider: [looks around] It's in that pot, isn't it? Flynn Rider: AH! [Pascal jumps off him] Would you STOP THAT?! Rapunzel: Now, it's hidden where you'll never find it. So, what do you want with my hair? To cut it? Flynn Rider: No! Listen, the only thing I want to do with your hair is to get out of it... literally! Rapunzel: You-- Wait, you don't want my hair? Flynn Rider: Why on earth would I want your hair? I was being chased, I saw a tower, and I climbed it. End of story. Rapunzel: You're telling the truth? Rapunzel: Mother Gothel: Rapunzel? Rapunzel, what's going on up there? Are you alright? Rapunzel: I'm the lost princess. Mother Gothel: Mother Gothel: Oh, please speak up Rapunzel. You know how I hate the mumbling. Rapunzel: Rapunzel: I am the lost princess, aren't I?... Did I mumble, Mother? Or should I even call you that? Mother Gothel: Mother Gothel: Oh Rapunzel, did you even hear yourself? Why would ask such a ridiculous question? Rapunzel: Rapunzel: It was you! It was all you! Mother Gothel: Everything that I did was to protect... YOU. Mother Gothel: Rapunzel. Rapunzel: [walking down the stairs] I've spent my entire life hiding from people who would use me for my powers? Rapunzel: Rapunzel: I should have been hiding... from YOU! Mother Gothel: Mother Gothel: Where would you go? Mother Gothel: He won't be there for you. Rapunzel: What did you do to him? Mother Gothel: Mother Gothel: That criminal is to be hanged for his crimes. Rapunzel: No. Mother Gothel: Now, Now. It's alright. Listen to me. Everything is as it should be. Rapunzel: No! You were wrong about the world. And you were wrong about me! AND I WILL NEVER LET YOU USE MY HAIR AGAIN! Mother Gothel: You want me to be the bad guy? Fine. Flynn Rider: The party lasted an entire week, and honestly, I don't remember most of it. Flynn Rider: [Flynn looking at his 'Wanted' poster] No... no, no, no, no, no, no, no, no, no, this is bad, this is very very bad, this is really bad... They just can't get my nose right! Flynn Rider: [in awe] ... You guys look amazing. Rapunzel: [Sung] I could go running/ and racing/ and dancing/ and chasing/ and leaping/ and bounding/ hair flying/ heart pounding/ and splashing/ and reeling/ and finally feeling/ now's when my life begins! Rapunzel: [to the group of thugs] Have some humanity. Haven't any of you ever had a dream? Hook Hand Thug: [approaching her menacingly, then knowingly] I had a dream, once. Hook Hand Thug: [During the 'I've Got A Dream' number] What about you? Flynn Rider: I'm sorry, me? Big Nose Thug: What's your dream? Flynn Rider: No, no no. Sorry, boys. I don't sing. Rapunzel: [During the 'I See The Light' number; Rapunzel sees Flynn holding two lanterns for her and approaches him] I have something for you too. Rapunzel: I should have given it to you before, but I was scared. And the thing is, I'm not scared anymore. You know what I mean? Flynn Rider: [Flynn gently pushes the satchel Rapunzel is holding in front of him aside and flashes a sincere smile] I'm starting to. Flynn Rider: [Awakes to see Maximus staring back at him, dripping water] Well, I hope you're here to apologize. Flynn Rider: Let me just get this straight, I take you to see the lanterns, bring you back home, and you'll give me back my satchel? Rapunzel: And when I promise something, I never ever break that promise. Flynn Rider: All right, listen! I didn't want to have to do this, but you leave me no choice. Here comes the smolder. Flynn Rider: This is kind of an off-day for me, this doesn't normally happen. Mother Gothel: [singing] Mother knows best /Take it from your mumsy /On your own you won't survive /Sloppy, underdressed,/Immature, clumsy /Please!/They'll eat you up alive! Mother Gothel: [singing] ... The plague! Rapunzel: Hi. Welcome home, Mother. Mother Gothel: Oh! Rapunzel, how you manage to do that every single day without fail, it looks absolutely exhausting, darling! Mother Gothel: Then I don't know why it takes so long. Flynn Rider: [sword-fighting with Maximus] You should know that this is the strangest thing I've ever done! Flynn Rider: ... How 'bout best two out of three? Flynn Rider: They don't like me. Flynn Rider: They don't like me either. Flynn Rider: Let's just assume for the moment that everyone in here doesn't like me! Mother Gothel: Rapunzel, please, stop with the mumbling. You know how I feel about the mumbling. Blah blah blah blah blah, it's very annoying! I'm just teasing, you're adorable. I love you so much, darling. Flynn Rider: Oh... oh no... where is my satchel? Flynn Rider: [Looks around the room for 2 seconds] It's in that pot, isn't it? Flynn Rider: [Upon being chased by the Palace Guards, Flynn and the Stabbington Brothers reach a dead end. They are facing a cliff] All right, okay, give me a boost, and I'll pull you up. Stabbington Brother: [the Stabbington Brothers look at each other] Give us the satchel first. Flynn Rider: What? I just... I can't believe that after all we've been through together, you don't... trust me? Stabbington Brother: [Flynn climbs up the Stabbington Brothers and reaches the top of the cliff] Now help us up, pretty boy. Flynn Rider: Sorry... my hands are full. Rapunzel: I've been looking out of a window for eighteen years, dreaming about what I might feel like when those lights rise in the sky. What if it's not everything I dreamed it would be? Flynn Rider: It will be. Rapunzel: And what if it is? What do I do then? Flynn Rider: Well,that's the good part I guess. You get to go find a new dream. Flynn Rider: So! Hey can I ask you something? Is there any chance that I'm going to get super strength in my hand? Because I'm not gonna lie, that would be stupendous... Hey, you alright? Rapunzel: [turns around] Oh. Sorry yes, just... lost in thought I guess. Flynn Rider: [shrugs] I mean because here's the thing. Superhuman good looks, I've always had them. Born with it. But superhuman strength, can you imagine the possibilities of this? Mother Gothel: Great. Now I'm the bad guy. Mother Gothel: I'm just teasing! Short Thug: [about Mother Gothel] Whoaaaa! Somebody get me a glass! 'Cuz I just found me a tall drink of water. Flynn Rider: What? I bought them! Flynn Rider: ... most of them! Flynn Rider: [from trailer] I didn't want to have to do this, but you leave me no choice. Here comes the smolder. Rapunzel: [there's a rustle in the bushes. Rapunzel jumps on Flynn's back, terrified] Is it ruffians? Thugs? Have they come for me? Flynn Rider: [a cute little bunny hops out of the bushes] Stay calm. It can probably smell fear. Vlad: [Points at wanted poster of Flynn Rider] Is this you? Flynn Rider: Oh, now they're just being mean. Mother Gothel: Skip the drama, stay with Mama! Rapunzel: I can't believe I did this. Rapunzel: I can't believe I did this. I can't believe I did this! Mother would be so furious. That's OK though, I mean what she doesn't know won't kill her. Oh my gosh. This would kill her. This is so fun! I, am a horrible daughter. I'm going back. I am never going back! I am a despicable human being. Woo-hoo! Best. Day. Ever! Mother Gothel: [Rapunzel has just locked Flynn in her closet] Rapunzel! Let down your hair! Mother Gothel: I have a big surprise! Rapunzel: Uh... I do too! Mother Gothel: Ooh, I'll bet my surprise is bigger! Rapunzel: [to herself] I seriously doubt it. Rapunzel: [circling Flynn tied to a chair with her hair] So, what do you want with my hair? To cut it? Flynn Rider: No! Listen, the only thing I want to do with your hair is to get out of it... lit-er-a-lly! Flynn Rider: [from trailer] I could get used to a view like this. Yep, I'm used to it. Guys I want a castle.